I Had the opportunity to interview an amazing woman this past month. Cyndi Crotts is a mulit-talented celebrity who can be seen in nearly every form of media you can imagine. Be sure to check her out on FaceBook http://www.facebook.com/profile.php?id=561to catch what she is doing currently. Having researched her for this interview, I can tell you that the woman is going non-stop with projects and public appearances happening all the time. I hope you all enjoy this interview as much as I enjoyed conducting it. First off thank you very much for the opportunity to interview you. After reading your bio, I am excited to hear the answers to some of your questions. These are just the starter questions. i may have some follow up questions based on answers you give to these. Also, I like to give the interviewee the opportunity seed some questions. I assume there are questions or information that people wish the interviewer would ask, so if there is anything you want put out there that I did not ask, please just let me know. First off, tell us a little something about you that is not found on your website, FaceBook or IMDB. Hee hee...I don’t think there is much more to tell. Pretty much everything about me is already out there. You list on your website Actress, Host, Pinup. Is that the order you prefer to be known as? And where does director fit in? Speaking of Directing, I found when I went from actor to director, I had less patience with actors. Has this been your experience or do you feel that you have more empathy for your actors? Actress will always be first on my list. PinUp Modeling & Hosting are kind of neck and neck right now. I enjoy both of those as well so when I’m not hosting my web shows, then I’m off doing PinUp photo shoots. As for right now, my directing skills come in as me directing my web shows. I haven’t had the opportunity to actually direct any actors so to speak but I am working towards that. I have a short film that I’m looking to get started on so once I get that written and ready to film, I’ll have my chance to see what it’s like to actually direct a film with actors in it. I feel confident enough that it will be easier for me since I am an actress first and will be a director 2nd when I’m ready to film my short. Since I know what the actors look for in a director I have more feelings for what the actors are like. If I was just a director an not an actor, then I would probably have no patience at all for actors since my focus would be directing. Again, we’ll see how it turns out. Do you prepare differently for traditional film roles than you do for webisodes? Also which do you prefer and why? No, there is nothing that I do differently to prepare since regular films and webisodes go through the same filming process. I like both but prefer films more so just because people tend to remember your characters more and in the independent world, you want your face seen as much as possible and get to as many people as you can. Webisodes are still fairly new to the web industry and to the film makers so I think in my opinion, those are going to take a little longer to get popular with people. The more web shows and webisodes that keep popping up on the net, the more people will talk about those and spread the word out to people. Something I noticed while on your website is that your look has changed frequently. A trait that I always found appealing in actors is their ability to transform themselves. Was that a conscious decision by you and if so how would you say it has aided you? It’s always good to go with a new look when ever you can. Sometimes it has been just a personal preference and other times, I thought if I did change, that it would help. In the long run, I decided on changes based on what I was interested in doing and this is how I want people to see me. I like giving them options and letting them know I can be versitle and not afraid of change. It has opened more doors for me since I’ve decided to do things my own way instead of what the industry wanted so to speak. I had to do what I felt comfortable with. You never want to be the plane jane, that only works for a short while then you have to move on. Being able to show the different sides of what I can play in films and what I also do in this business, has helped me greatly and keeps people always guessing at what is she going to do next. Being different and trying to stand out is one thing, but showing different sides of who you are and who you can be is another. Sticking with the acting persona, what is your dream role? I don’t have an actual dream role so to speak but it would for sure be an honor if I got cast in a film by any or all of these directors...Adam Green, Quentin Tarantino, Eli Roth & Robert Rodriguez. I love all their style of films and they all have action, blood, gore and even some humor so basically it’s everything a person could want in a film. This would be my dream come true to work with these guys on one of their films. I have so many people that I look at and watch in the film industry. I can’t say that I have just one person so to speak. There are so many things that inspire me. I guess really just having a strong drive to be in this field and to give it all I got is what keeps me going and striving for more. Of course there are my friends and family that also support what I do and that helps also. I love that you are the image for a comic book. One of my favorite celebrities Jane Weidlin of the GoGos is doing that as well and frankly it amazes me that we don’t see it more often. How did you happen to get into this medium? I became involved in the comic book world when Jeff Hughes of Comic Book Divas contacted me last fall of 2010 an wanted me to be a part of Comic Book Divas as one of their models. From there I was contacted by Dennis Willman of Iron Dead Studio’s, to be involved in his comic book series called “Ginger-Stein: Rise of the Undead”. The comic book is created by Dennis Willman and published through Comic Book Diva’s. Dennis also is the man behind the artistic drawings for each and every character in this comic book series. Do you have any input into the storyline of the Comics? So far I haven’t...this comic was created & written by Dennis Willman. When he does write the scenes and comes up with new things, he lets us know about them and if there is something that we don’t like, I’m sure he would listen to our input. As of right now, he’s got an awesome comic book and we all love what he’s done with it so far. He is truly an amazing guy and I’m very honored to be a part of his comic. Pin-up model time. Being an active duty military member, I know how much the role of pin-up has played in Americana. How did you get into the pinup business? Funny, you ask this question. I actually wanted to play around with the idea to see if I did have a pinup look. So I decided to go out and do a pinup photo shoot and post up a few pictures from it to see what type of response I would get from my friends an fans. I was very surprised at the positive response and feedback that I had received from everyone. Then the next thing I know, I get a message from a company called PinUp America that was brand new and they were looking for girls to be in their pinup girl contest. I had never done this before but I thought what the heck, let’s see what can come of it. 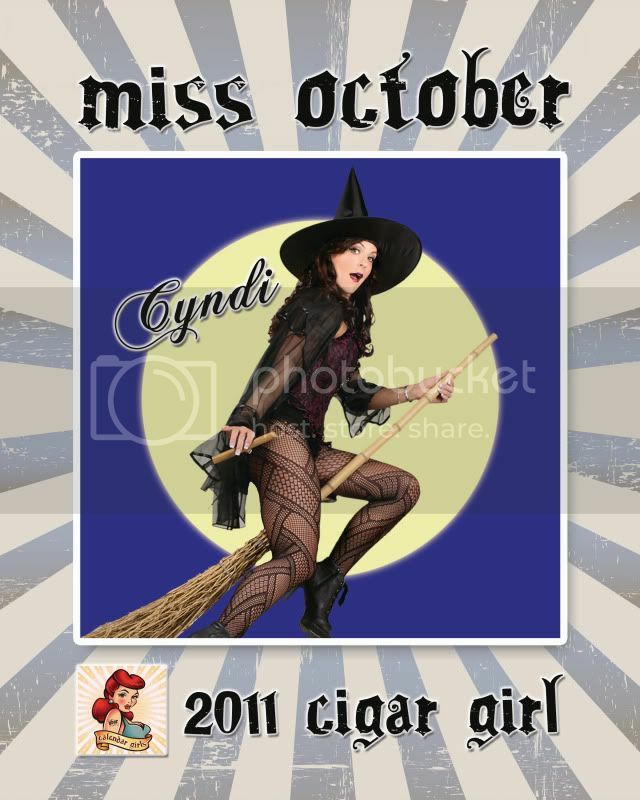 After the contest was over, I received an e-mail from PinUp America telling me that I had won and that I was chosen to be one of their top 12 pinup girls for their 2011 Cigar girl calendar and that I would also be featured in their 1st issue of their magazine as well. I was so excited and couldn’t believe it. Ever since, I’ve stayed involved with the magazine, and have been in a few other issues along with the other 12 winners as well. I’ve been contacted by a couple of other companies as well asking for me to be their model for their product or for their store. So it’s been a really great time being in the pinup world. I really enjoy it. Who are some of your favorite pin-up models of all time? Well to be honest, I never kept up with that era much but, if I had to pick I would say Rosie the Riveter. My mom always called me that ever since I was a kid. One piece of advice for aspiring actors/pin-ups? First rule, always keep your guard up and if it sounds to good to be true, then it probably is. Never give up on your dream and don’t let anyone tell you that you can’t do it. Always have faith in yourself. I just recently finished up on a short film called B.F.F Directed by Chris Greene of Detour Entertainment. I had such a great time on this film working with everyone. What a real pleasure it was to work with Chris and his crew. I am working on a 2012 PinUp Scream Queen Calendar, 2 web shows and my very first feature film “Hells Little Angels” which I wrote. My company Traveling Brat Productions, is behind all these projects and is currently putting it all together. All these projects are very time consuming but will be well worth it. I’m so looking forward to showing off my new projects in 2012. Do you make public appearances? If so, where can we see where you will be appearing? I actually just finished my very first appearance at Days Of The Dead in July 2011 held in Indianapolis, Indiana. I had so much fun getting to be around fans. I hope to make more appearances in the future. If you want to know other conventions or appearances for me, you can always check out CYNDILAND at, http://cyndicrotts.blogspot.com or you can check out my official website athttp://www.cyndicrotts.com. These will be the only 2 places you can find out about that. In your bio, it says that you have moved around a lot. Any particular place that was a favorite? On the same note, any place you haven’t been to yet that you plan on traveling to in the future? On a side note, not really a question but more of a statement, picture 15 on your site under Professional Photos…Amazing pic! Where do you want to be in five years? In other words, what do you want to accomplish in that time span? I hope in 5 years that I have become more involved in the entertainment and by then at least be more on the Elite side of things in the industry. How has social media affected you? Has it helped you or made things more complicated? It’s actually been pretty good so far. It’s still early to tell a whole lot as of right now but so far, I feel it will work out well in the long run. Finally, since this interview is for Bloodletting.org what character type best suits you? Vampire, Slayer, Witch, Werewolf, or Angel? I would have to go with Vampire...that would be more my style out of the 5 choices. Awesome interview, and pic 15 IS a good one. Think it's the eyes that does it. Check out her home page and facebook profile for more details. Hmmm. Fascinating woman. She has such unique beauty about her as well. Beautiful photos. Interesting prospect of the interviews. I never noticed this forum before. Oh wow she's really pretty! I can't wait to check out her other work. Awesome interview and great pictures! I love the fact that she does everything under the sun. Oh and for the person that just noticed this forum, we actually put this forum up about 3 months after the site launched. Our first interview was with Phoebe Price. If there was a way to "like" this, I totally would. She is a beautiful and talented woman, thanks for the great interview! This was a great interview DVH. It's awesome that she has taken up many different things and been successful in all of them. I agree with Dr Van Helsing, i like how she does the pics in the sun.